Travellers protest march on the Dáil, December 2009. Pictured (l-r): Britney, Kelsey, Sinead and Jay Casey with their grandmother Mary Casey from Limerick. 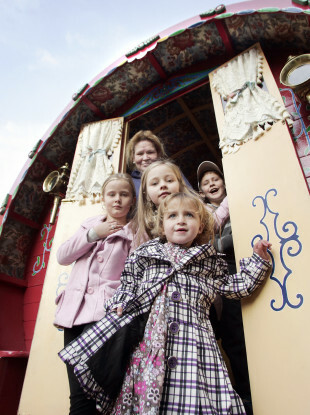 A LEADING CAMPAIGNER for Travellers’ rights has said that although the recognition of Traveller ethnicity was an historic step, that it wasn’t “a magic wand” to fix issues including housing, education, and healthcare in their community. The issue of Traveller ethnicity has been put into the spotlight after presidential candidate Peter Casey’s remarks saying that he didn’t regard it as necessary to designate them a “separate” ethnic status – calling them “people who camped on others’ land”. In opinion polls that were conducted before those comments and before the four televised presidential debates, Peter Casey was on 2%; his final tally is looking to be close to 20%. Martin Collins, a cofounder of Pavee Point, said that it was inaccurate to say that Travellers had a ‘separate’ ethnicity, which points to further isolation. Speaking at a talk at the Douglas Hyde Gallery on Thursday evening, Collins said that Casey’s comments about Travellers legitimised others’ discriminatory actions. It’s reckless, irresponsible, and I would say an incitement to hatred. People say in response to that, it’s ‘free speech’. Free speech is a qualified right – it does not mean you have a right to incite hatred or violence. Following his surge in the polls, Casey said that he regretted “not coming down harder on Martin Collins – he’s the person responsible for showing leadership at Pavee Point”. The Pavee Point spokesperson said he has “represented his community at national and international level for several decades and will continue to do so”. As Taoiseach I wish to now formally recognise Travellers as a distinct ethnic group within the Irish nation. It is a historic day for our Travellers and a proud day for Ireland. May all the people of our nation live in the shelter and never in the shadow of each other. Although this didn’t change anything in law, it acknowledged how Travellers could be discriminated against and recognised their distinct culture. The acknowledgement also led to a State inclusion strategy which means that the government must publish an annual report on the progress of policies aimed at helping the Traveller and Roma communities. Collins said that although he would like Traveller ethnicity recognised in law, that he would much rather campaign on issues like access to education, accommodation, employment, and healthcare. Since 1963, there have been four reports into the role of the Travelling community in Irish society: the first contained the line “there can be no final solution of the problems created by the itinerants until they are absorbed in the general community”. Other reports ignored attacks on the Traveller community; a report in 1995 acknowledged “mistrust and “barriers” between the Traveller and settled communities. Although there has been some progress on these issues in almost two years since Traveller ethnicity was recognised, gaps remain. Collins spoke of Travellers’ contribution to Irish traditional music and storytelling, and crafts. He also spoke about ‘hawking’, or going from door-to-door selling materials that other people don’t use – recycling before the environmentalists came along, he said. When you’ve been given the message that you’re less intelligent, less sophisticated by your society, there comes a time where you believe it. Your mind becomes colonised, and that’s what happened to my community. Email “'We can't fight racism on our own': A year and a half on from Traveller ethnicity”. Feedback on “'We can't fight racism on our own': A year and a half on from Traveller ethnicity”.